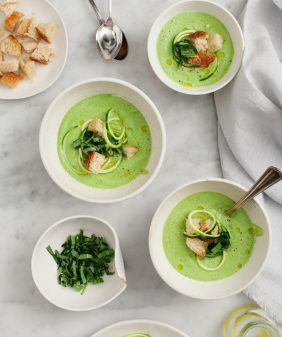 Sautéed leeks and lemony, herb-filled creamy almond spread are layered over socca to create a unique, healthy spring or summer dinner. Vegan & gluten free. Jack and I made this last Saturday night for dinner. I got the inspiration from this photo of a leek tart that I pinned. Leeks aside, my recipe is entirely different. I decided to try socca (a chickpea flour pancake/dough) as a healthier alternative to puff pastry… not that it’s equivalent to a flaky puff pastry, it’s just something I’ve been wanting to try. I wanted to create a sort of herb-cream cheese spread, but without cheese, so I made a dill and chive spread using almonds as the base. It was so good that we couldn’t stop eating it by the spoonful as we were making the rest of components of the meal. This spread could be used in so many different ways, as a dip for pita chips and raw veggies, or thinned out and tossed with greens as a creamy salad dressing. Socca is one of those things that I think you have to try at least twice to get just right. I was pleasantly surprised at how easy and delicious this was, being my first go at it. The only thing I’ll do differently next time is to put less batter in my pan (or use a larger pan) for a slightly thinner, less dense, crust. (It looks thin here but chickpea flour is surprisingly filling). I topped this “tart” with sautéed leeks and, for crunch, some toasted almonds. We popped open a bottle of red wine and had a lovely casual evening out on the patio. Socca recipe adapted from Mark Bittman’s method. Make the socca: In a medium bowl, combine the chickpea flour, water, 2 tablespoons olive oil, garlic, and salt and pepper. Whisk until smooth, cover, and set aside to soak for 30 minutes. 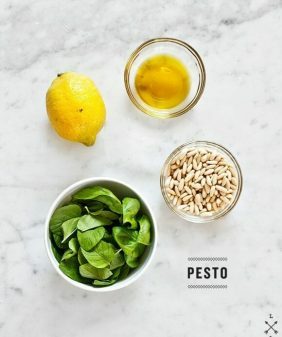 Make the almond-herb spread: In a high speed blender, combine the almonds, garlic, miso, lemon juice and zest, nutritional yeast, ½ cup water, 1 tablespoon olive oil, and pinches of salt and pepper. Blend, adding more water and/or olive oil as needed to get your blade moving and to create a creamy, paste-like consistency. 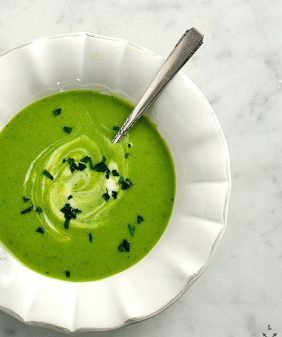 Pour into a smaller bowl and stir in the ¼ cup herbs. Taste and adjust seasonings. Place in the refrigerator while your socca cooks. When you’re ready to use the spread, you may need to thin it with a bit more water. When the oven is preheated and your socca batter has rested for 30 minutes, remove the preheated skillet from the oven with a pot holder, add the remaining 1 tablespoon olive oil, and brush to coat the bottom and sides of the pan. Pour the batter into the pan and bake for 12 to 15 minutes, until the edges of the pancake have set. Heat the broiler and brush the top of the socca with a little olive oil if it looks dry. Broil socca for a few minutes, until its top is spottily browned. Let your socca cool a bit before assembling with the almond spread. In the meantime, heat a drizzle of olive oil in a small skillet over medium heat, and sauté the leeks with a pinch of salt for a minute or two. 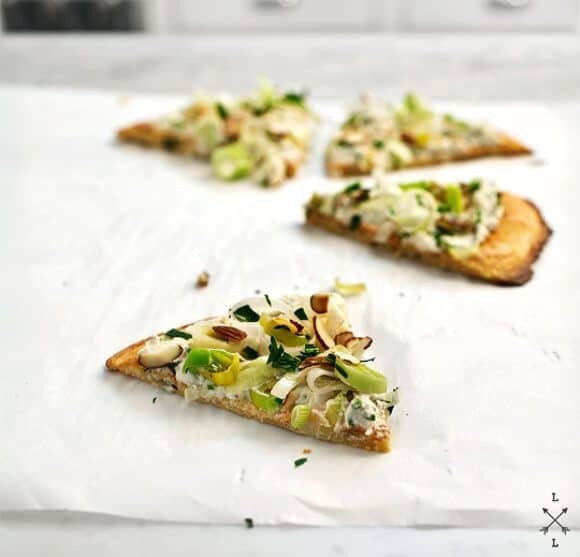 When your socca has cooled, layer on the almond herb spread (you might not use it all), sautéed leeks, sliced almonds, and a sprinkle of the remaining herbs. *To blanch the almonds, drop in boiling water for about 30 seconds, remove and transfer to a bowl of water filled with ice. Skins should slide right off. This might be just as tasty with the skins left on, but I was going for a white, not brown, color. Alternatively, you can soak your almonds overnight, but I didn't think of that far enough in advance. **I made this in a 10-inch skillet (I don’t have a 12-inch cast-iron skillet as the recipe calls for, but I really need to get one). Next time I would either make this same recipe in a larger skillet, or pour in one-half to two-thirds the amount of batter. I love all the components of these tarts and so the combination sounds just perfect. Oh geez, sorry about your thumb but thank you for powering through recipe typing to give us this beauty! Can’t believe this is vegan. It looks really good and I think it could even fool non vegans! Thanks for sharing. That looks delicious! I’m not vegan or gluten-free or anything but it really looks and sounds yummy so I’m going to try it. When I have reacted quickly to break up a dog scuffle, I yell REALLY loudly and slam into the fight with my hip – I believe this is a “hip check” in some sport. It has worked so far. Slam into them to stop the fight, then grab whomever’s collar and yell at the other one (if there is not another person to help). Still, it’s very dangerous getting between dogs. Water, for separating the babies. Just a squirt bottle if inside and out the hose. Hope this helps. The recipe looks amazing. Thanks Holly, I’m going to try keeping a squirt bottle nearby. Hi there, just discovered your site recently and loving it! I am a huge fan of socca, and the herbed almond spread sounds out of this world. Great combination. So sorry to hear about the injury, hope it heals speedily! i have two giant dogs, a pyrenees and a newfoundland both females. the newfoundland came second. they would do great for the most part except around feeding time, as they both tried to take the more dominating role, one night it exploded and the went at so much that i could not stop them by just yelling. i screamed as i tried to separate them, i felt anxious and scared for them finally after a few attempts like holding a chair and bagging it they separated but i knew i need help i was freaked out. i called my brother in hysterics, he came a few minutes later and told me exactly what to do and it works. when they start to show even the slightest aggression, grab their leashes and hooked them on then make them sit ( not lie down just sit) do this till they stop looking at you, they will keep staring as they try to dominate you once they look away detach leas and walk away no praise at that time, repeat every single time there is even a hint of aggression, soon you will just have to grab the leashes and they will sit and finally stop all together, i was amazed how in a few days it was all over. sorry you got hurt, that is the scariest when you know it is done by dogs you love. this will work. Thanks Nadia, I’ll try this. What a trooper you are, so sorry to hear about your thumb! But such a lovely tart! 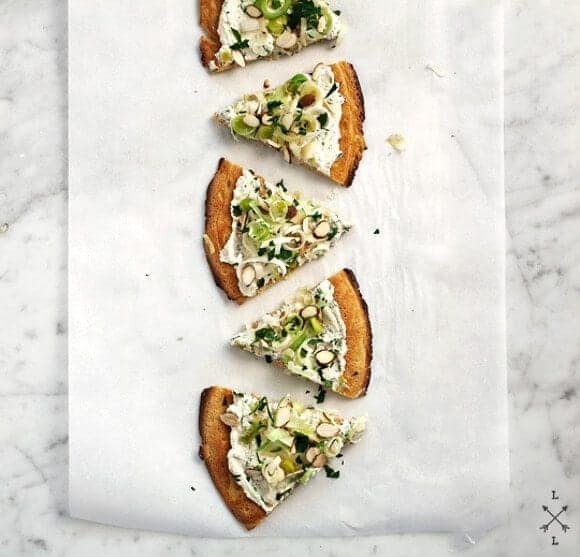 That socca sounds great–almond cheese and leeks, yes please! And I hope your thumb feels better soon! 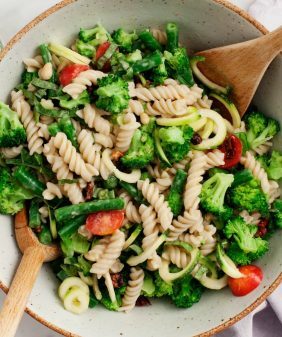 I just discovered your site from a link on Healthy Green Kitchen. Can’t wait to explore! I’m sorry to hear about your thumb, I hate it when sh*t like that happens. I’m no fighting dog expert, but one time Cookie and my friend’s dog got into it in the living room. My friend first tried to break them up with her hands and she got nipped, but then we threw a blanket over them and the fighting stopped. And socca? I’ve never tried it but have no doubt I’d love it! I’ve been known to split up dog fights with a squirt bottle full of water. Squirt the crap out of them and that should take care of it. Squirting the crap out of them also works when they’re bothering you at the dinner table, trying to sit on furniture (assuming you don’t normally allow them on the furniture), etc. And now comes the moment of truth.. I don’t own a dog. But one of the families for which I nanny has a couple of dogs and the squirt bottle trick works every. single. time. PS – sorry about your thumb. PPS – gorgeous socca “tart” – I really need to try socca. Like, now. I keep hearing about socca, and I NEED to try it! 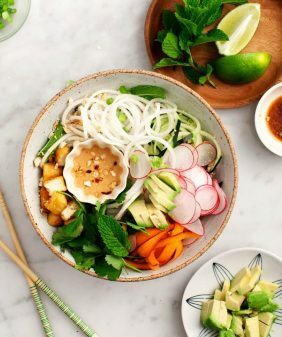 This looks so delicious and decadent, while still being healthy. Perfect for summer! Beautiful pictures, and loving the white marble background! Definitely giving me food photography inspiration! This looks seriously amazing! I’m now wondering how quickly I can get some into my mouth. Hope you got your pups sorted out! I cannot wait to try this one! Everything I’ve tried from your site is outstanding; making the mushroom enchiladas for my dad tonight. For the pups, spray bottles, whistle or high pitched “yip”, or, worst case scenario, a quick tail tug, will all help redirect their attention for a moment. Good luck! First off, your blog is beautiful. Secondly, I am moving to Austin in the near future, and your post on the Hillside Farmacy made me that more excited. Lastly, dogs can be so unpredictable some times. My hound is usually so friendly and lovely, and then all of a sudden he is a jerk. What I have learned about breaking up fighting dogs is to grab them from the rear, around the waist, pulling them up and back towards you. This startles them and it also puts their neck at a weird angle so they can’t really keep fighting. It also keeps you from getting your hands in the middle of a scuffle. I suppose the size of the dog can make this difficult, but it is a handy trick if you can get a hold on their behinds. Sorry to hear about your thumb! Just found your yummy site vi Pinterest. About the dogs, I’ve heard that lifting their back legs works (from a friend who walks dogs for a living). Just grab both back legs of the agressor and lift. Saves you getting in the way of the sharp end! Hi Greer, great idea, thanks! Beautiful blog! This post caught my eye (I love socca), so I decided to give it a whirl. Dee-licious. I even made it two nights in a row and blogged about it. I can’t wait to try some of your other recipes! I just wanted to stop over and say thank you for sharing this. My boyfriend and I made socca the other night. 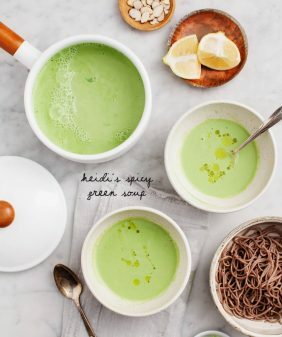 (We topped ours with an avocado, lime, sriracha puree and a mound of fresh peas, leeks, and radishes.) We used garlic in the socca and a touch less oil, as you suggested, and it was perfect! So easy and delicious. It’s a new staple dinner item for us now. Thanks again! Hi Natasha, so glad you liked it. Your toppings sound absolutely delicious!